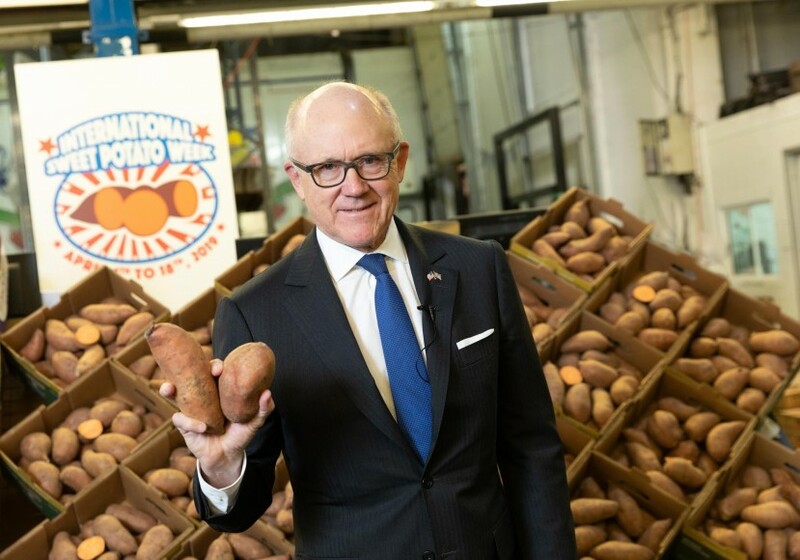 With International Sweet Potato Week about to get underway, the US ambassador to the UK has visited traders at New Covent Garden, hailing the vegetable as a “fine example of US-UK trade”. 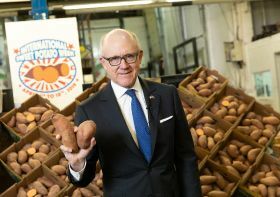 Woody Johnson noted that demand for American sweet potatoes has quadrupled in Britain in the past decade, adding that he wants to help other American products to be just as successful. ISPW, which runs from 4-18 April, forms part of a marketing campaign featuring PR and social media activity and a raft of food and health influencers. This year’s campaign, which will also run in Germany, Benelux and France, focuses on the nutritional value of sweet potatoes. Johnson said: “62 per cent of British consumers already understand the health benefits of sweet potatoes but this campaign will be really important in sharing the news with more people. Sales of sweet potatoes and are now worth £94 million annually in the UK, with the majority supplied from the US. Though household penetration is at 45 per cent, annual sales only make up five per cent of the total potato market in the UK. In recent years, US growers have invested heavily in storage and logistics to supply the UK year-round.